The concept of a "mixed marriage" in the western world usually refers to a marriage between partners of different ethnic backgrounds or races. However, among most Indian-Americans, a mixed marriage can also easily refer to Indian couples from different parts of India itself (with differing regional languages), or different religions (Hindu, Sikh, Christian, Muslim, etc. ), or different castes, or all of the above. Chetan Bhagat, an IITD/IIMA graduate and bestselling author, based his latest book, "2 States," on his own experience of attending college, meeting a girl from a different Indian region than his own, and of their ensuing relationship, family troubles and resulting "mixed marriage." Bhagat's previous books have inspired movies, with the most recent one being the movie "3 Idiots," based on his book, "Five Point Someone" that draws upon his IIT/IIM experiences. In "2 States," Bhagat's style is direct, straight to the point, and one in which he takes numerous liberties with stereotyping North and South Indians (both areas now representing his own family) making for a hilariously good read. Anyone having read Bhagat's previous bestselling books such as, "One Night @ a Call Center, or "Five Point Someone", knows that the author speaks to a contemporary Indian audience and does not hold back in his often blunt, yet honest, writing style. The college crowd, recently graduated, and those young-at-heart can relate to many of the issues, some of them controversial, that Bhagat raises in his stories. Bhagat is not afraid to speak out and write about social issues he sees happening among the new 'upwardly mobile' young adults of today's India. Issues such as rebelling against religious upbringing, drug use, relationships prior to marriage, pressures of school, family, and society on today's youth have caused controversies and will spark many interesting conversations. The story, "2 States," is about a boy, named Krish, who meets and falls in love with a girl, Ananya, in his Economics class in MBA school. The details of their lives at college and the sometimes shocking but outrageous anecdotes of college life, are mixed in with sensitivities of ancient customs, cultural norms and the timeless angst felt by young adults finding their way in the world. Bhagat's characters, especially the descriptions of Krish's parents and of his relationship with each, are developed well enough to get the reader to understand the nuances of the story. The relationships are not always simple, and we see Krish struggle with the complications in his life, especially as he wants to start a life of his own. Bhagat is keenly aware of the issues that divide Krish and Ananya's respective families. Both sides hold stereotypical views about each other without first getting to know one another. Bhagat points out the differences and opinions in a funny and direct approach. Some of the blunt, one line, comments make the reader laugh out loud. Bhagat succeeds in presenting the points of view from both sides of the drama. Krish's character has qualities of rebelliousness mixed with a hunger for parental approval, which make his character all the more believable. Ananya is portrayed as a strong, intelligent, modern woman who knows how to get what she wants, yet has vulnerable aspects as well. Bhagat spares us from a typical melodramatic story by making it young and fresh with current issues faced by today's youth, and by throwing in humor as much as possible. Many Indian authors whose books I have recently read have been women. Bhagat brings a relevant, young, male voice to the mix. 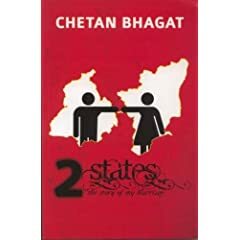 Bhagat's "2 States" was a quick read that was fun, enjoyable, and something to read without a serious attitude.